The memorial visitation has been re-scheduled. It will be from 10:00 - 12:00 on Saturday April 20th at the Fulton Chapel of the Bosma-Renkes Funeral Home. 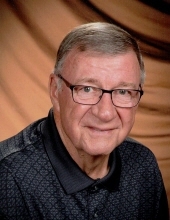 JERRY VANZUIDEN, 74, of Fulton, IL, died Monday, April 1, 2019, at Mercy Medical Center North, in Clinton, IA. Cremation rites have been accorded. Memorials have been established to First Reformed Church and St. Jude Children’s Hospital. Jerry was born March 11, 1945, in Morrison, IL, to Gerald E. and Alice (Smit) VanZuiden. He was a graduate of Fulton High School. Jerry married Diane J. Hawk on August 28, 1965, in Immaculate Conception Catholic Church in Fulton. Jerry was employed for 35 years at Equistar (Lyondell/Basell) Chemicals in Clinton, IA and retired from there in 2004. He was a former member of the Fulton Fire Department and a former member of the Fulton City Council. Jerry was a longtime member of the Fulton Country Club and served on the Board of Directors. He was a former Director on the Chemical Credit Union Board. Jerry enjoyed golfing with his many friends and fishing and boating. He loved his wife, children, grandchildren and great-grandchildren. Survivors include his wife, Diane; two sons, William (Elizabeth) VanZuiden of Fulton, IL and Jeremy (Larissa) VanZuiden of Clinton, IA; seven grandchildren, Jennifer and Jeffery VanZuiden, Lydia Bilyeu, Allison (Bill) Patrick, and Mara Bilyeu; Cassandra and Emma VanZuiden; six great-grandchildren; and one brother, James (Kathy) VanZuiden of Fulton, IL. To send flowers or a remembrance gift to the family of Jerry VanZuiden, please visit our Tribute Store. "Email Address" would like to share the life celebration of Jerry VanZuiden. Click on the "link" to go to share a favorite memory or leave a condolence message for the family.